The gabarre flat-bottomed boat, from the Greek karabos meaning shell, refers to several types of river boats in various places along the Atlantic seaboard. Their flat bottom means that with a shallow draught, they can transport a maximum load. The ones on the Loire Valley often have rigging as well. They are made of clapboard, that is, overlapping planks joined with wooden pegs. Le terme gabarre ou gabare ou gabarros (du grec karabos, coquille) désigne plusieurs types de bateaux fluviaux sur la façade atlantique. Leur fond plat appelé « sole » permet, avec un faible tirant d’eau, de porter un maximum de charge. Celles de la Loire sont souvent gréées. Elles sont construites à clins, c’est-à-dire que les planches qui constituent la coque se chevauchent et sont chevillées par des pièces de bois. This one is my favourite so far. 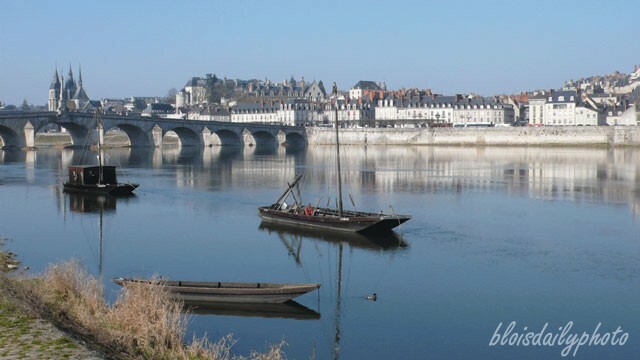 Blois is very white and the Loire barges (I think that’s what these are in English, but my boatspeak is not totally up to speed) always picturesque. Yes, it’s my favourite as well. I think I should actually call them flat-bottomed boats rather than barges because some of the companies that run river trips use the term for larger, modern barges.